James lives in Essex with his wife Ann, two sons Oliver & Ethan and their three chickens: Sparkles, Superman and Jeff. James describes himself as a bald, baking banker from Brentwood with a bad back. His friends say he looks more like a bank robber than a banker. Always keen to embark on a challenge, James also trained as a port diver for the Royal Navy Reserves, where it was his job to keep the ports clear during the cold war. 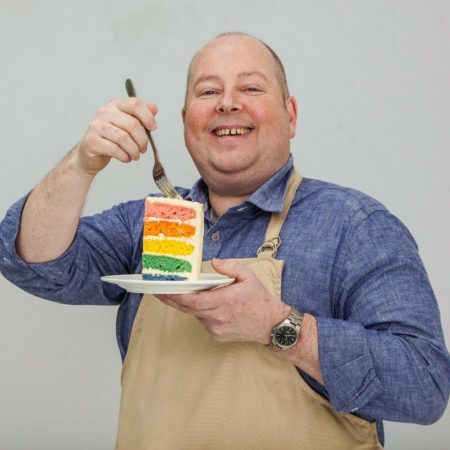 When he’s not banking in Canary Wharf, James loves to spend his free time in the fresh air at his allotment, growing fruit and vegetables to incorporate into his bakes. James’ main baking influence is his father, Brian, who first taught him to bake over 40 years ago. When a classic British teacake meets Scandinavian hygge, only good things can happen. Have a go at James’ Signature Bread Week bake. James’ school-inspired steamed orange and ginger pudding is as nostalgic as it is delicious. Serve it after a roast ham on a Sunday afternoon, with plenty of custard.